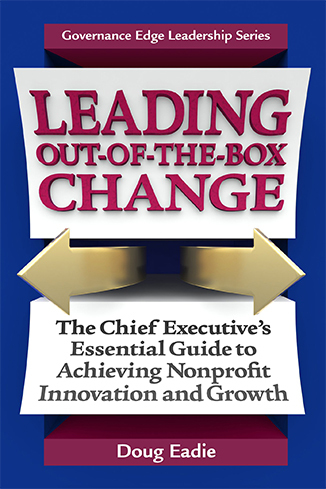 In his path-breaking new book, Leading Out-of-the-Box Change, Doug Eadie describes the leadership role of the chief executive officer as Innovator-in-Chief. He also lays out the key elements of the Change Investment Portfolio Process, a powerful new change planning tool to help you take command of high-velocity change. Doug defines “out-of-the–box” change initiatives as opportunities to generate significant innovation while meeting challenges standing in the way of growth. Out-of–the-box change initiatives, he writes, involve a high level of technical and/or political complexity and demand a much larger claim on resources. Driven by your organization’s vision, these high-stakes initiatives require a distinct and separate track that operates outside the annual planning and budgeting process. This readable volume offers a valuable roadmap to putting in place the Change Investment Portfolio process within your organization and involving your board intensively from start to finish.